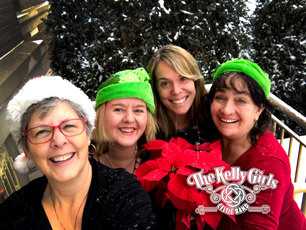 Hear ye, Hear ye, 'Tis the Christmas season and The Kelly Girls invite you to an enchanting and exciting evening of beautiful ballads and rousing renditions of Christmas and Seasonal songs, all with a Kelly Girl Celtic twist! Add in a dash of dancing or prancing and a sprinkling of songs from our new CD and you'll be feeling merry and bright all night long! The Kelly Girls have quickly gained recognition as one of the most entertaining Celtic Bands in New England. Rousing renditions of songs and tunes rooted in the Celtic traditions of Ireland, Scotland, Canada and America along with captivating harmonies and instrumentation lend to their signature sound. The Band has played many prestigious venues and festivals, and continues to garner media attention for both their traditional and original music. The Kelly Girls recently released their first album, “May You Always”, which has numerous collaborations with award-winning Canadian songwriter Nancy Beaudette – the group’s guitar, bouzouki and mandolin player. The compliment also includes Dublin native Aisling Keating on tin whistle, flute, bodhran, and ukulele, Bostonians Christine Hatch on banjo, guitar, and harmonica, and Melinda Kerwin on fiddle.